(By Natalya Estrada, Times Standard News, 10/19/16) EUREKA, California – Humboldt County’s record-breaking steer, Danniel the Holstein has found his forever home at Lost Coast Hay in Eureka. Previously, Danniel was living in a temporary pasture at the Sequoia Park Zoo for the summer as owners Ken and Ann Farley searched for a place for him to stay permanently. 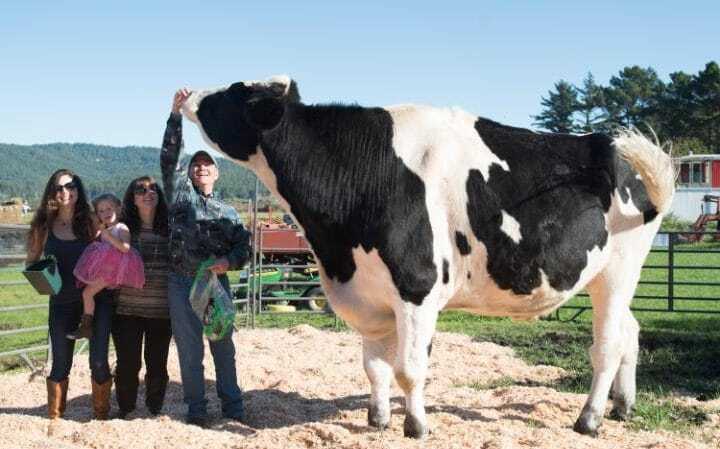 The steer was measured in September and has unofficially been confirmed by Ferndale veterinarian Dr. Kevin Silver as the world’s tallest bovine ever recorded at 6 feet 4 inches. 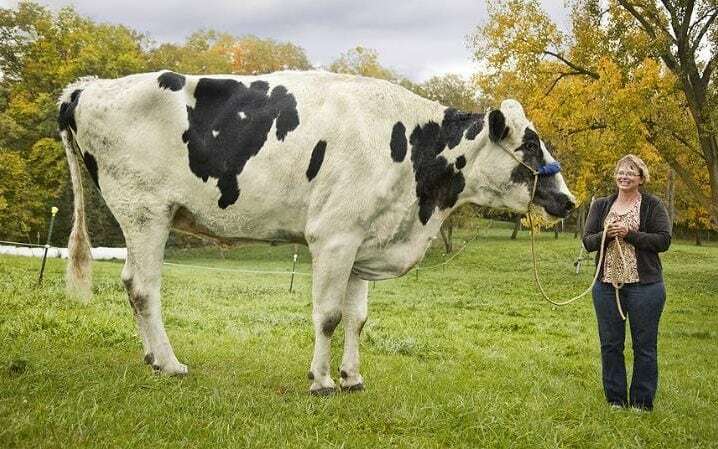 He measured just over an inch taller than the current Guinness World Record holder, Blosom, who was owned by Patricia Meads-Hanson in Orangeville, Illinois. Blosom died last May at the age of 13. Danniel’s story could have turned out a lot different if his owners weren’t the Farleys, who said a lot of male Holsteins don’t make it to adulthood. Usually female Holsteins are dairy cows, the males are typically slaughtered for beef. In September, Ken Farley told the Times-Standard that having Danniel here was special and that the steer was part of his family. Having seen Danniel grow from a calf to a giant, Farley said he was still impressed by the steer’s size. Lost Coast Hay assistant manager Amber Heidinger said Danniel is set to move in at the end of this week and the giant steer will have a lot of space to graze. “We’re getting ready for him. He has a great big pasture and we’re also building him a covered shelter for when it rains,” Heidinger said. She also said people can come see the giant steer free of charge once he’s settled and that Lost Coast Hay took Danniel on a permanent loan so he cannot be sold in the future. “Basically, the zoo was looking for a place for him and the owner wanted him to stay in Humboldt. So, now he’s moving here,” Heidinger said. Seqouia Park Zoo Director Gretchen Ziegler said the zoo wouldn’t be able to keep Danniel for the rainy season because of limited space. She said animals like Danniel, because of their immense size and consumption, need several acres of grass to roam and the pasture they had wasn’t enough to sustain him and the yaks they currently have. She also said the biggest padding they had for the steer wouldn’t grow enough grass for him to graze on. Ziegler said the zoo helped the Farleys identify possible places for his relocation and feel that Danniel will be happier now that he’ll have more room to roam in a more natural environment. Before his brief stay at the zoo, Danniel lived at Ken Farley’s aunt’s farm on Redmond Road off Old Arcata Road. 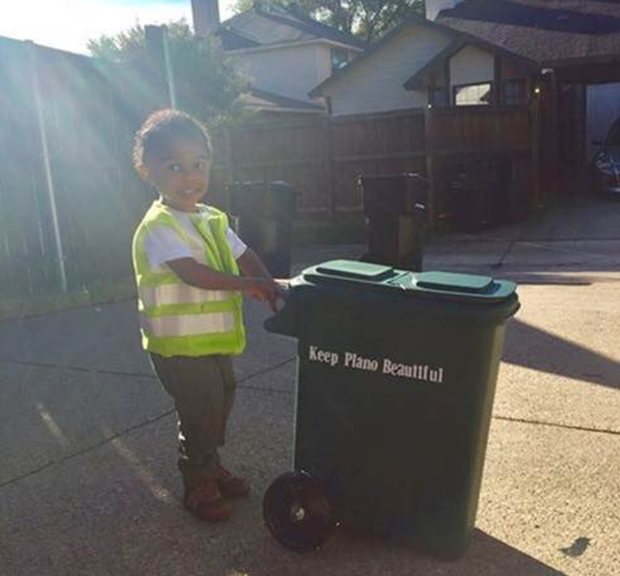 (CBS News, 11/15/16) PLANO, Texas – Every Monday, like clockwork, two-year-old Lance gets ready for trash day, CBS Dallas-Fort Worth reported. The Plano toddler wheels his mini recycling bin to the curb, dressed as his buddy, James Jackson the trash man. Lance waits with a quiet smile, as the familiar rumble and squeak of the city garbage truck fills the alley by his house. It’s a unique friendship formed nearly a year and a half ago, when the Rufus family moved into the neighborhood where Jackson picks up the trash. Four years on the job, and now Jackson has a new sidekick. The friendship between the toddler and Jackson quickly blossomed. Jackson even gave his buddy a “City of Plano” toy bank. Lance hasn’t been able to put it down. Lance’s parents dressed him up as Jackson for Halloween. Chantal and Garrett made a tiny recycling bin, and a matching reflective vest. The friendship is warming hearts, and it’s only a matter of days until the friends see each other again. (by Ben Hooper, UPI, 11/23/16) ISHIKARI, Japan – The Japanese arm of pizza chain Domino’s announced it is testing an unusual solution to winter weather difficulties — delivery by reindeer. 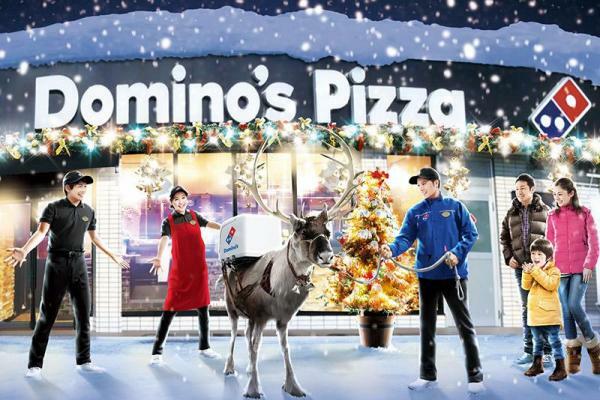 Domino’s Japan announced it is currently testing out the possibility of using riderless reindeer to deliver pizzas in the snowy north of the country amid expectations of a particularly harsh winter. The company released pictures showing how the pizza warmers mounted to the reindeer’s backs would work, as well as photos of reindeer training to be pizza-delivery deer on the grounds of a driving school in the icy city of Ishikari, Hokkaido. A video posted to YouTube by Domino’s Japan shows how the reindeer deliveries would work and how the company would use GPS trackers to follow the progress of the deliveries. The video reveals the plan still has some kinks, such as ensuring the pizza warmers remain affixed to the reindeer and preventing the animals from wandering dangerously into roads. The company said it is still working on some other issues with the scheme, including ensuring the safety of any people or animals who encounter the reindeer and determining how the reindeer would be trained to walk long distances without accompaniment.